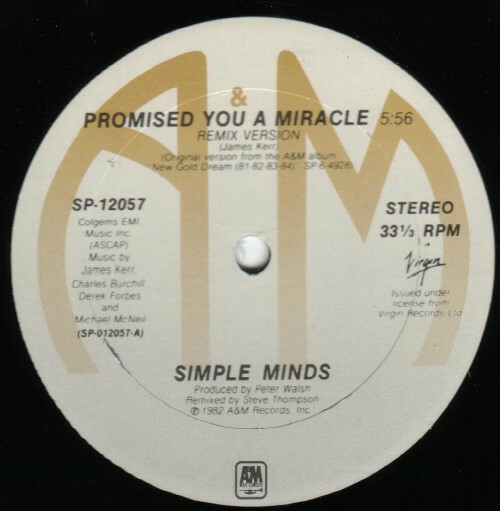 With the NDA I was under now lifted, the whole world knows that on July 29th, the six disc version of Simple Minds highly regarded “New God Dream [81, 82, 83, 84]” album will grace the “shelves” of many a retailer with a view of having one of my own, eventually. It was sort of avant garde of Simple Minds to drop their Super Deluxe Box of “Sparkle In The Rain” first in 2014. Anyone else would have expected this puppy first, and for good reason. It’s a flawless album that has only dated in that “they don’t make ’em like this anymore!” How many albums from 1982 sound this timeless and continue to reward after decades of careful listening? Correctly, this was the album that took them from Cult Act to chart toppers for all of the right reasons. It was the foundation their larger career has been built upon. The first disc comes to us in a new remaster from the hand of Andrew Walter of EMI’s Abbey Road Studios. This means that this is the first remaster of the album since Simon Hayworth’s in 2002 that has been the source of every version released until now. Walter has extensive classical credits with a smattering of pop in his long career, so I am expecting wonderful sounds from this remaster! The man probably wouldn’t even know what a brickwall plugin was! I am looking forward to hearing still further nuances from this album which is packed with lush detail like no other. The second disc is extended remixes. I noticed immediately, that this time Ian Caple’s instrumental remix of “Seeing Out The Angel” is there. My 1st pressing of the Themes series had the album version in error. 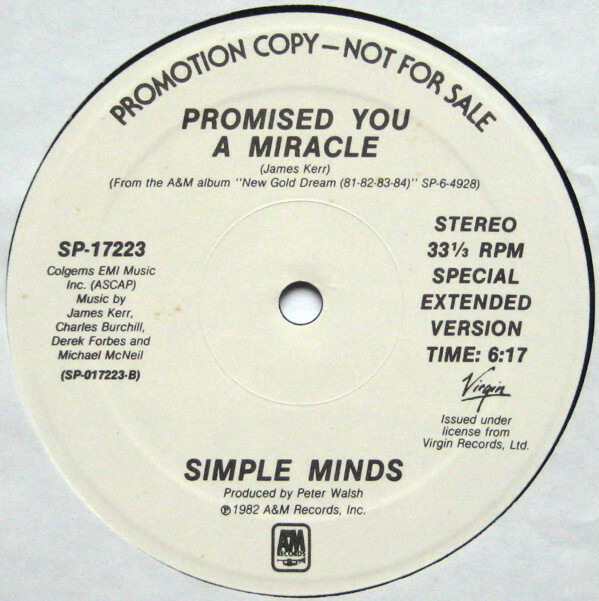 I always thought that there were two unique US mixes of “Promised You A Miracle;” the 12″ and dub version but this reveals a second US 12″ promo mix… wha…??!! Note the timings: 5:56 for the disc at right [in my Record Cell] and 6:17 for the WLP 12″ at right [not in my Record Cell – I had always thought it was identical to the commercial edition]. This is certainly intriguing! Also, the “King Is White And In The Crowd” as included on the infamous “Touch” tape was an instrumental remixed version, but as it was interrupted by an interview with Jim Kerr talking over it, getting a copy was never a priority. This time it’s been restored to its never-before glory. Nice! Disc three is just edit mixes, and strictly for the trainspotting crowd, though I am interested in finally having the short version of the title track on CD as it was the version on the gold vinyl US LP from all of those years ago. Disc four finally issued the four Peel Sessions which have been, to date, m.i.a. in the commercial sphere. I was impressed to see that the full Peel Session was used, including the two “Sons + Fascination” cuts that technically, fall out of the purview of this box. Disc five is the major Monk-bait! I’ve read about the demos and full length takes that had been edited down for release on the wondrous Dream Giver site. The thought of hearing the full length 10+ minute version of the title track finally gets my knees weak! I’m guessing that this disc reflects some of the material that surfaced in 5.1 on the “New Gold Dream [81, 82, 83, 84]” DVD-A that I managed to buy before it went three figures. Those 5.1 mixes by Ronald Prent are once again released as disc six, for the many who missed out. One thing I notice was that “Colours Fly + Catherine Wheel” and “Promised You A Miracle” were included on the 2005 DVD-A in 2.0 since the multi-track masters could not be found. This time, no such wording is included. I am wondering if the multi-track master has been found in the ensuing decade? The DVD is said to have the entire album [plus “In Every Heaven”] in 5.1 so we’ll see. Do I want this? Yes! There is about two discs worth of material that is new to me here and at the very least, this should be a spectacular sounding remaster of this album! While, on one hand, I am crestfallen that there is no live concert material as with the “Sparkle In The Rain” SDB, what has been offered here looks more than worth my purchase. Quite frankly, just hearing the title cut last even longer than the “German” 12″ remix of 6:52 would make me click “pre-order.” Of course, there are other variants: single CD, 2xCD [with extended disc], LP, Blu-Ray, etc. but you know how we roll in PPM land. We’ll be getting the Full Monty. I had been wondering if they would include the Prent 5.1 mix or instead commission Steven Wilson [who did the last two SDBs in 5.1] just to make these all of a kind and now I know. The healthy upside to this decision to use the existing Prent work [which should be more widely heard, in any case – it’s a wonderful 5.1 mix!] is that the cost of pre-ordering this SDB, which contains one more disc than the “Sparkle In The Rain” SDB did, actually costs less! £36.99 delivers this bad boy to you own personal Record Cell straight from the Simple Minds webstore. This entry was posted in Core Collection, DVD, New Romantic, Scots Rock, Want List and tagged 1982, 2016, 5.1, boxed set, DLX RM, New Gold Dream, Simple Minds. Bookmark the permalink. Don’t think anyone else will produce the bang for my buck that NDG SDB will this year! I too MUST hear all and every version of the title track that can ever be sourced. Monk you have me aching to get at my records tonight…I am SURE I have that US Promo of Promised You A Miracle as one of my really good friends was working at A&M at the time. MUST FIND! Echorich – Yeah, it’s very comprehensive, and the price is generous. So you also thought the WLP was the same mix as the commercial 12″? I must have seen that thing dozens of times, back in the day and passed it up! I just hope it’s not a case where the commercial edit was faded 20 seconds earlier! We’ll see. However would have liked some live stuff as well…just being greedy. SimonH – So you’re saying Gordon Gekko was right? Imagine an additional cd/DVD or blu ray of a full gig from the period….but hey I’ll take what’s on offer at that price. SimonH – The Newcastle gig added as a bonus to the utterly worthless “Verona” DVD (disc 2 of the “Seen The Lights” collection of 2003) is the best that we have to content ourselves with. I would hope that the full gig was recorded but that half hour is better than nothing. It should have been added to the DVD, don’t you think? Funnily enough I’ve ordered the single disc Verona DVD, purely to have those songs. I paid the princely sum of £3.20 (inc shipping) for a used copy. I intend throwing the packaging away, slipping it into a paper sleeve and storing it in my SuperDeluxe box! I’ll never watch the main feature! SimonH – Thank goodness they didn’t chop the godlike Newcastle gig off of the “Verona” single disc! WARNING! If you ever watch the main feature, your small intestine may leap up through your body and throttle your brain in an attempt to stop the pain! I’m almost tempted to watch it now, note: ‘almost’…. SimonH – You may fall asleep before any such shenanigans occur. It is hard to believe that they were the same band that could do no wrong from 1979-1984 though. Tell us about this NDA. Did you work on this? 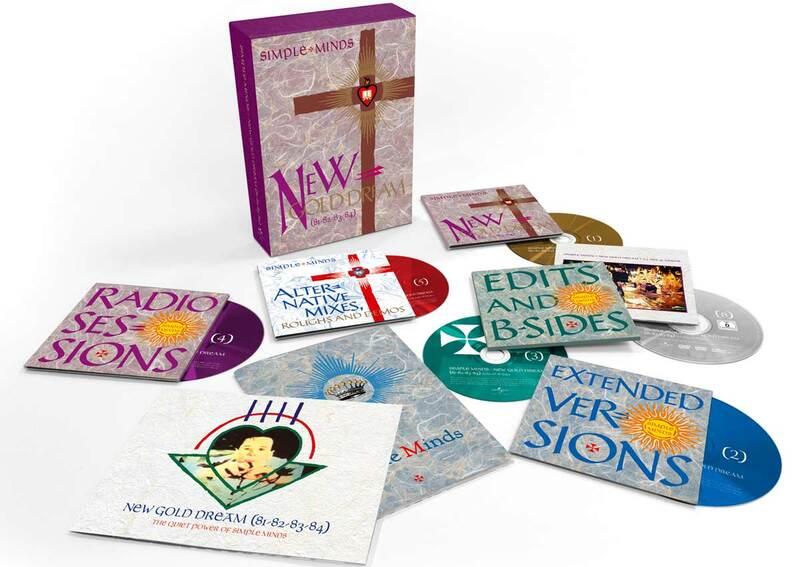 I am a stranger to this album (the Simple Minds bug never infected me) but I have to say damn, it’s refreshing to see one of the SDE box sets with a price tag that the word “reasonable” may be associated with. Tim – No, I was just corresponding with Simon Cornwell, who runs Dream Giver. I had turned to him for assistance with getting the corrected Simple Minds DVD and booklet for the “Sparkle In The Rain” Super Deluxe Box which had production errors. He offered to take my case to UMG since he was working on all of these Simple Minds archive editions. He mentioned that “New Gold Dream” was in the pipeline but not to spread it around, so I didn’t. Yes. It is a decent price fir a change, isn’t it? Quite the set.I find disc 4 and 5 essential.Full duration versions should be cool as long as they are not remix/cut up/looped things.Disc 2,3 and 6 are not for me.Of course,the remaster of disc 1 should be a treat,anything Abbey Road is bound to be well done.I only have the original CD issue which is a bit flat.I do have the original LP and that has now been quite played out.In comparison,the Sparkle remaster from 2015 was cleaner yes but also unpleasantly louder to my ears.NGD has not aged one bit since it has come out.Quite the achievement. Jordan – This album has only grown in stature with the passage of time for me. In 1982 it was one album among many vying for ear time. Today, I see it as 1982’s towering achievement and the signpost of an era ending. Some great respect must be given to the production of Peter Walsh on NGD. Not only a producer but a man with his hand in arranging and engineering this masterwork. Only the year before, Walsh added a guiding hand to Heaven 17’s Penthouse And Pavement, helping to elevate that album well beyond its Human League Mk.1 roots. A year after NGD his guidance would be sought by Peter Gabriel and the man who he would stand behind for the next 30 odd years, Scott Walker, assisting the artist through his dark journey. I am so thrilled by this news,though unlike the rest of you chaps I didn’t actually hear NGD until 2015!! Although I am a lifelong fan of the 80s/synth/post-punk scenes,I never really “got” SM at the time and don’t recall any of my friends playing the album.So strange considering that when I did hear it last year it totally blew my mind. Oddly,in the 90s I did buy “Empires and Dance”,which I love. I would love to fork out for the full set of NGD but will have to play it by ear financially as my partner and I have just last week bought a house together so things have all gone a bit mad. 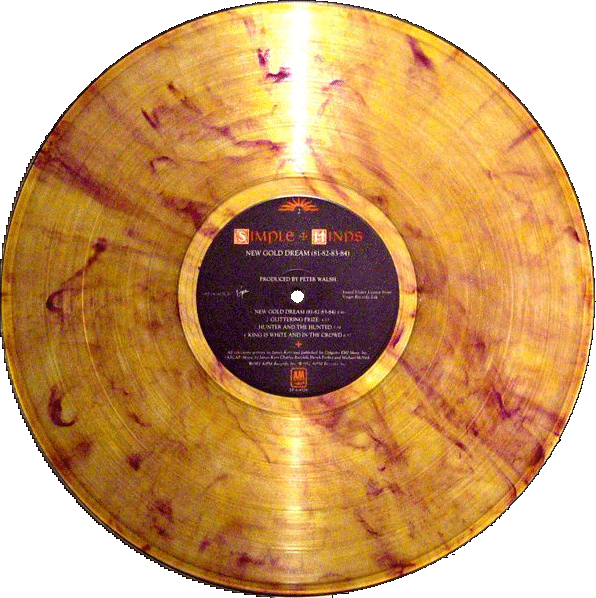 I have heard of the rare gold disc of the original LP,would love to get hold of that! fletchtalks – Welcome to the comments! Alas, it will probably take a few months [at best] before I have the scratch to buy this. I am going to Nashville next week for the Bryan Ferry concert there and I have been saving for a trip to Grimey’s! I certainly hope that UMG releases a project with no errors, but that’s not likely. There is certainly plenty to commend on this package. The full-length title track is certainly my highlight of the studio stuff and it’s great have the King instrumental. I was most looking forward to having official release-quality versions of the Peel Session tracks, as I’ve only had YouTube downloads of the versions taped from the radio. However, the versions tracks sound exactly like they’ve been lifted from second generation recordings and not from the BBC master tapes. There is dropout and stereo fluctuations that I wasn’t expecting, especially on Promised You A Miracle. Or have I got a dodgy CD? Will Swanson – Welcome to the comments! As for the previously unreleased Peel Session, Simon Cornwell of Dream Giver [ he was consultant/arch fan to the boxed sets] has revealed that the BBC master tape was lost [probably wiped, knowing cheap Auntie Beeb] and that he and UMG turned to fan recordings as source material for those four tracks. So your ear is sharp. Those were 2nd generation recordings! Your CD is fine. Thanks for that! I decided to do a bit of repair work myself, cleaning up the dodgy areas and restoring the song starts with some copying and pasting and some re-EQ-ing! It’s a shame the box set didn’t include a concert recording as I was looking forward to that. The Manchester gig would’ve been a great choice. Will Swanson – Hearing of work like this makes me wonder when labels will simply crowd source the pre-release prep out to fans. We’re over half the way there now, I think. Look at Simon Cornwall. I absolutely agree. There’s a guy known as Dexbam on YouTube who’s done some amazing clean-up jobs! Will Swanson – Remind me again why we have labels?